UFO Daily Bread: CHRIS BLEDSOE SR. I greatly debated whether or not to include the now infamous "DISCOVERY" show, "UFOS OVER EARTH - THE FAYETTEVILLE INCIDENT". Simply because, it does not accurately recount the events of that fateful January 8th, 2007 day. CHRIS BLEDSOE SR. and his family suffered ridicule after the show aired. However, I first learnt of his incredible story through the show, and believe it does help give us a good jumping off point for discussion. "UFOS OVER EARTH - THE FAYETTEVILLE INCIDENT"
I happened across another unrelated show called "THE TRUTH ABOUT UFOS IN RUSSIA" and was shocked to see a photo of the very same "spiked object" CHRIS BLEDSOE SR. described in the documentary! "THE TRUTH ABOUT UFOS IN RUSSIA"
About a month later I was listening to "Vox Populi - The Chris Bledsoe Story" produced by MEL FABREGAS on his show "VERITAS". An excellent, respectful interview portraying the man Chris Bledsoe Sr. was prior to his experience, and the man he's become today. I was reminded of STAN ROMANEK's miraculous recovery from a leg injury he was scheduled to have surgery for written about in his book titled "MESSAGES". 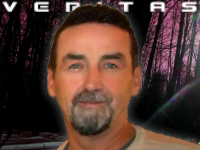 "THE STAN ROMANEK STORY - MESSAGES - FULL UFO CONTACT DOCUMENTARY"
Soon after, I stumbled upon an archived show running on the fast growing favorite 24/7 radio network called "KGRA - GLOBAL RADIO ALLIANCE" where such Ufology/Paranormal Investigator personalities like RICHARD DOLAN, PAOLA HARRIS, and CASSIDY O'CONNOR host their own shows. I highly recommend you take a look at this treasure trove of quality radio programs showcased through KGRA. RACE HOBBS and ROYCE FITZGERALD co-host a show on "KGRA" called "EYE WITNESS RADIO". I happened to catch their "CHRIS BLEDSOE SR INTERVIEW" playing late one night. There are some great insights brought forward worth noting, and I encourage you to listen to their interview. Most importantly the Polygraph Exam results are discussed in great detail, including the fact that all three of the other witnesses passed. Chris Bledsoe Sr. only failed ONE question of the THIRTY FOUR he was asked! "EYE WITNESS RADIO - RACE and ROYCE - 07 - CHRIS BLEDSOE SR. INTEVIEW- 02-28-2013.MP3"
This interview is currently not free, unfortunately. But, it will be available for those who do not wish to pay the $4.99/month 'Planet Monthly Membership' fee, in 60 to 90 days from the date it aired; February 28, 2013. It reminded me of the scene in the popular film "Fire In The Sky" depicting TRAVIS WALTON's abduction where his co-workers witness Travis being hit by a beam of light. Both Chris Sr. and Christopher Jr. are on their way home, after dropping the men off at their respective homes, only to find five or 6 cars pulled over looking at the dark object that is still in the area. Witnesses of this spectacular night of events continue to come out of the woodwork helping solidify and add credibility to what these men experienced. The encounter ends strangely with the being mysteriously becoming invisible; simply vanishing. Needless to say, the blind came crashing down, and the men retreated further into the house. The night finally ends without further incident. These incredible events have severely impacted all the members of the BLEDSOE family. CHRIS BLEDSOE SR's wife, YVONNE BLEDSOE, reacted from both the mind of a mother protecting her children's innocence, and of a woman who was brought up in a very conservative religious home. YVONNE BLEDSOE has since come around to understand and accept something profound has touched both her husband and dear child. She realizes allowing them to speak of their experience is part of their healing process. It's been a difficult journey for JUNIOR as he continues to struggle with accepting what he experienced that fateful night. CHRIS BLEDSOE SR. has a very unique way of looking at life since his experience. I want to extend a special thank you if you've made it to the end of my article. Normally I don't have such long blog entries, but I couldn't seem to shorten it any more than I already had. It's an incredible story that deserves respect and attention. I wish all the best to the BLEDSOE family in health, love, and prosperity. Their courage is admirable!